Is the Gujarat government evading a Supreme Court order of 2014 on payment of death compensation to as many as 152 manhole workers who died due to asphyxiation since 1993? It would seem so, if a recent note by Gujarat-based non-government organization (NGO), Janvikas, is any guide. Prepared by senior activist Jitendra Rathod, the note says that Manav Garima Trust, a community organization of Valmikis in Ahmedbad, filed a right to information (RTI) plea on December 21, 2015 to find out what exactly has happened to death compensation. 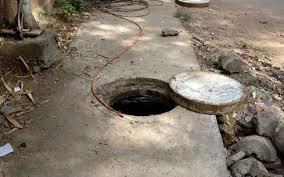 The Manav Garima Trust has submitted to the Gujarat government a list of 152 manhole workers, who have died while cleaning drainage without any safety devices since 1993, and written to several departments insisting on compensation. Letters alongside other details have gone to the Director of Municipalities, the Managing Director of the Gujarat Safai Kamdar Vikas Nigam, the Principal Secretary of Social Justice and Empowerment Department, and the Director of Scheduled Castes Welfare. It also wrote the Gujarat Chief Minister and the Gujarat Chief Secretary on this. “The apex court directed the all state governments to identify the families of all persons who have died in sewerage work (manholes, septic tanks) since 1993 and award compensation of Rs 10 lakhs for each such death to the family members dependent on them”, the note says. The Supreme Court barred “entering sewer lines without safety gears”, saying it should be “made a crime even in emergency situations.” For such deaths, it insisted, a compensation of Rs 10 lakh should be given to the family of the deceased. “Despite the Act prohibiting the practice of manual scavenging and judgment of Supreme Court, practice of manual scavenging is rampant in Gujarat and especially in cities. There are around 200 spots where sweepers are forced to clean human excreta every day in Ahmedabad city”, the note points out.